Dubai - the exotic jewel of the United Arab Emirates. Bordered by deserts and beaches, Dubai provides stark contrasts, from intriguing Islamic culture to the ultra-modern, high-tech metropolis of the 21st century. The city is a magnificent expression of an incredible vision and an uncompromising statement of success and opportunity. Dubai has something for everyone, from vacationers seeking a relaxing break away from the pressures of work, to business travelers looking for a new exciting experience. The emirate is an international conference, exhibition and leisure destination. Lying on the calm, blue waters of the southern Gulf and flanked by the majestic desert, Dubai offers year-round sunshine and five-star luxury along with the adventure of a unique Arabian experience. Dubai is a class destination with all the modern amenities of the western world. It is a fascinating emirate with beautiful buildings, excellent restaurants and nightlife as well as white sandy beaches, culture and history that you can feel as you visit the souks, shopping malls, museums and historic buildings and sites. 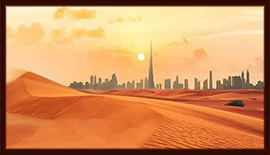 Dubai has a sub-tropical, arid climate. Sunny, blue skies can be expected most of the year. Rainfall is infrequent and irregular, falling mainly in winter. Temperatures range from a low of about 10.5°C /50°F to a high of 48°C/118.4°F. The mean daily maximum is 24°C/75.2°F in January rising to 41°C/105.8°F in July. Lightweight summer clothing is suitable for most of the year, but sweaters or jackets may be needed for the winter months, especially in the evenings. Compared with certain parts of the Middle East, Dubai has a very relaxed dress code. However, care should be taken not to give offence by wearing clothing which may be considered revealing, for example low-cut dresses, very short skirts, or tight shirt or top in public. At the pool or on the beaches, trunks, swimsuits and bikinis are quite acceptable. Good quality sunglasses are advised, and photo chromatic lenses for those who wear spectacles. Hats, or some protection for the head, are advisable when in direct sunlight. Dubai's culture is firmly rooted in the Islamic traditions of Arabia. Courtesy and hospitality are among the most highly prized of virtues, and the visitor is sure to be charmed by the genuine warmth and friendliness of the people. Dubai society is marked by a high degree of tolerance for different lifestyles. Foreigners are free to practice their own religion, alcohol is served in hotels and, provided reasonable discretion is shown, the dress code is liberal. Women face no discrimination and may drive and walk around unescorted. Despite rapid economic development in recent years, Dubai remains close to its heritage. Local citizens dress in traditional robes and headdress. Arab culture and folklore find expression in poetry, dancing, songs and traditional art. Weddings and other celebrations are colorful occasions of feasting and music. Traditional sports such as falconry, camel racing and dhow racing at sea continue to thrive. The official language is Arabic but English is widely spoken and understood. Both languages are commonly used in business and commerce. Normal tourist photography is allowed, however it is considered offensive to photograph Muslim women. It is also courteous to request permission before photographing men. The monetary unit is the dirham which is divided into 100 fils. The dirham is linked to the Special Drawing Right of the International Monetary Fund. It has been held constant against the US dollar since the end of 1980 at a mid-rate of approximately US$1= Dh3.67.